Tungsten Electrodes are used when arc welding with the GTAW/tungsten inert gas (TIG) process or PAW/Plasma welding. Other than to start the process, it is necessary to grind tungsten electrodes after they have touched the molten weld pool or the filler rod to the tungsten, which is not only time consuming but can also be a hazard to health. Recognising both the performance requirement and the risk to health posed by thoriated tungsten electrodes, Huntingdon Fusion Techniques HFT®’s MultiStrike® Tungsten Electrodes not only deliver an increased performance, but also reduce the risk to health. A customer in Cheshire, UK recently said: "The introduction of MultiStrike has been welcomed by all our welding staff. The new electrodes are giving excellent results and demonstrating much improved strike characteristics. Although more expensive than the previous electrodes, their life is significantly longer which is expected to lead to long-term cost savings. We are also aware of the health and safety benefits of using non-thoriated electrodes." 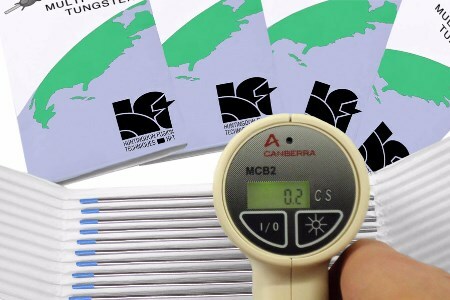 MultiStrike Tungsten Electrodes contain a mix of non-radioactive rare earth elements, which dramatically lower the working temperature of the tungsten electrode, making it longer lasting. MultiStrikes can be used for welding aluminium with the AC process as well as steels and alloys with the DC process, which allows the welder to have just one type of tungsten electrode to weld all materials and reduce the amount of stocks and purchasing requisitions. Other tungsten electrodes work at higher temperatures so their oxide additions (mostly radioactive) burn out, or evaporate much faster than those non-radioactive ingredients in MultiStrike, so much so that they give at least 10 times more arc striking capacity of other tungsten electrodes tested under the same conditions. With most tungsten electrodes in use still containing radioactive and carcinogenic 2% thorium oxide, MultiStrike provides the TIG and plasma welder with a safe and superior alternative.